What a great gift for the special men in your life. 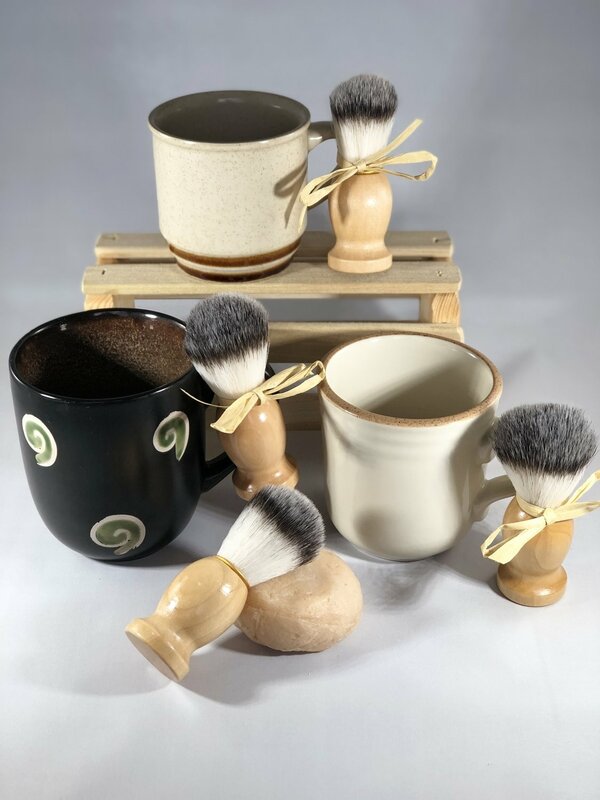 This mug shave soap kit comes with a stoneware mug, a badger hair shave brush with wooden handle, and a puck of homemade shave soap. The shave soap is appx. 2.5 oz and is scented with one of our all-time favorite scents, Rustic Woods and Rum, which smells like light cedar, a little bit of hickory and rum. This soap has a super rich creamy lather that helps with a smooth shave as you can see by the example photo. Quantities and styles are limited. The three mugs pictured are the current styles: 2 black mugs, 3 with brown rings at bottom of the mug, and 7 with brown top rim. If you wish to choose one style over the other, please message me with your style and I will check to see that it is still available. Ingredients: Water, Coconut Oil, Stearic Acid, Tallow, Glycerin, Shea Butter, Castor Oil, Potassium Hydroxide, Sodium Hydroxide, Sodium Lactate and Fragrance Oil.